Learn more about the characteristics of platinum metal. The purity of the gold Karatage is indicated by a number followed by "k" and shows how much of gold is in that piece of jewelry. 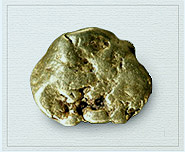 Karatage is expressed in 24ths, making 24k gold, 100% gold. 18-karat gold is made of 75% pure gold and 25% of other metals (18/24 ratio). Jewelry of this fineness is marked as "18k.” The European designation is "750," meaning 75 percent gold. 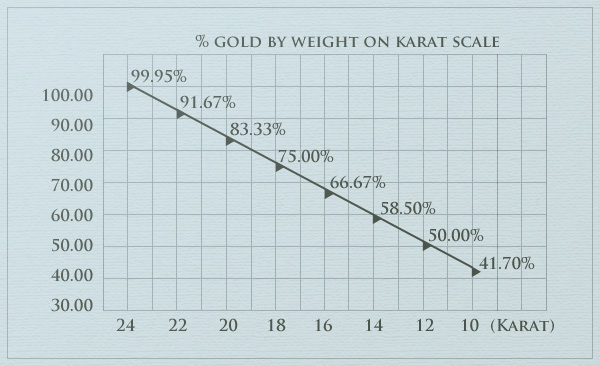 14-karat gold is made of 58.5% pure gold and 41.5% of other metals (14/24 ratio). Jewelry of this fineness is marked as "14k.” The European designation is "585," meaning 58.5 percent gold. Because 14k gold is composed of only 58.5% gold, and 41.5% other metals that give it strength, its gold color is not as rich as 18k gold. Yellow Gold Gold natural color is yellow, however the alloys is what give the gold more saturated and rich shine. An specialist combination of copper, silver and pure gold gives this precious metal its signature warmth. White Gold A silvery white character is what makes white gold jewelry so appealing. White gold is created by combining gold in its purest form with varying alloys such as zinc, copper or palladium and occasionally tin or nickel. Because 18k white gold is 75% gold, and 14k white gold is 58.5% gold, jewelry made from these metals has a slight yellow color. To enhance the whiteness, almost all white gold is plated with rhodium, a shiny, white metal which is extremely hard. Depending on the amount of wear to a piece of jewelry, over time this rhodium plating may wear off, revealing the original metal color. Re-plating is a simple process that can be done to restore your jewelry's whiteness if needed. Rose Gold The beautiful pink hue of rose gold jewelry is created by using a copper alloy. Again, the overall percentages of metal alloys is the same for rose gold as it is for yellow or white, there is just a different mixture in what alloys are used. Gold jewelry prices are dependent on the purity of the gold, the used karat weight on the piece, the market value of gold, and the level of craftsmanship and design of each jewelry piece.